Located in a secluded enclave on Norris Lake, "Rustic Haven" cabin provides an ideal location to feel as though off the busy path. You feel located deep into the woods yet hop in your boat and travel approximately 2 minutes for the ski waters of Norris Lake near the famous "Jump'n Bridge." Enjoy food and drinks at Sugar Hollow Marina and Shanghai Marina only minutes away. Directly off the parking area enter the cabin to view an open floor plan w/ supplied kitchen, dining room, TV room, and 2 bedrooms each having a king bed). Walk outside and onto the deck to find the gas grill and fantastic view of the mountain with a flowing creek. Walk off the hot tub deck to find the dock with swim platform. Jump into the TVA's cleanest lake without any boat traffic screaming by. Fish right off the dock to catch the biggest bass you will find anywhere. Lakeside Estates is only 7 minutes from Lafollette's many conveniences including groceries, golf, restaurants, medical, etc. Must be minimum 28 years of age to book this cabin. John Bertke lives in Dayton Ohio and enjoys visiting Norris with his friends and family. He enjoys fishing and smoking cigars. He took over management of this property in early 2016. They say 'location' means everything. "Rustic Haven" cabin is 7 minutes from the city of Lafollette, 5 minutes from the main road, inside a gated community, nestled in trees, right on the water's edge. I'm an avid fly fisher, my wife loves to golf, and my daughters never tire from wakeboarding so my whole family stays happy when we visit Rustic Haven. Each bathroom supplied with 6 bath towels, 6 wash clothes, 2 hand towels provided. Washer and dryer located in cabin. Downtown Lafollette is only a 10 minute drive. Cabin is built right on the secluded shoreline. Beautiful view of tree covered mountains. Listen to the water running down the creek. All beds supplied with flat sheets, fitted sheets, pillow cases, comforters. Enough spaces for approximately 5 cars. From parking, enter to "Main Level" requiring no steps. Each bathroom supplied with 6 towels, washcloths, and 2 hand towels. Full kitchen supplied. Detailed kitchen inventory supplied to you. 2 courses nearby. Contact us for details. There are no steps from the gravel parking area to the main floor. Do keep in mind there are no other wheelchairs provisions. Exclusive >>>> we change the hot tub water prior to your arrival. Firewood delivery available. Path to boat dock a little treacherous especially when wet. Nice boat dock and swim area. We had a great week at this location. Loved the dock and the water was wonderful. We swam, fished, boated, kayaked, went to the jumping bridge, zip lined and enjoyed family. The pictures need to be changed on the site, description is inaccurate. This is not the dock, the dock is similar but there are no steps leading to house, straight up like showed. If you have elderly or anyone who can't do steps with you, BEWARE! The lower part after many steps at Rustic Haven is a slope that can be treacherous. The other photo that is not accurate is the boat dock, It appears to be beside the house, it is actually quite a way from the house. Other notes, the dryer took 2 to 3 cycles to dry and many of the beds are extremely hard, some of us used the couches to sleep on because they were softer. I would have given it a better review if I didn't feel deceived. I am glad your group had a fun time staying at our beautiful cabin. As you pointed out this very popular cabin is secluded which is rare for water front property. Unfortunately from here your review becomes needlessly reckless. I clearly provide my contact information and my crew's contact information. All you simply needed to do was call for the dryer repair. In fact since we manage so many properties we actually have spare appliances on site. In regards to your opinion about "hard beds", if I install soft mattresses the next group will have back aches. Everyone who has been to most East Tennessee lakes including Norris Lake know the mountainous terrain is challenging for those with limited mobility. As for the dock picture you are correct in that the pictured dock is the same style and builder as the actual dock. This picture was used as an accurate representation while the actual dock was being assembled. Your accusation of deceit is again reckless. Examine all the positive reviews on this as well as all of our cabins. Since there are so many positive reviews perhaps you should reevaluate your expectations. Rustic Haven is a great house in a quiet cove. 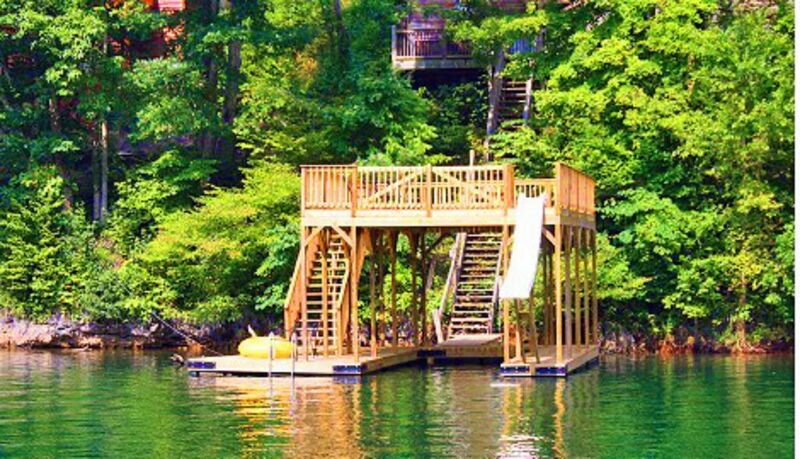 The double deck dock with slide was the highlight of the week! Our family and friends loved this house/location. The house had lots of space for everyone and a separate area for our teenagers. Lakeside Estates is close to town for those last minute items and close to many marina's on the lake, plus just a short boat ride from the jumping bridge! Such a beautiful home and amazing view! The house was very clean and the property lovely. The only real issue was there was no fence surrounding the top of the hill where we parked our cars. We were only concerned because we had small children and dogs. We had a wonderful time and would stay again. Definitely reccommend this home for a fun vacation! We were mostly happy with the Rustic Haven cabin. We also understand that the cabin was recently sold so that had something to do with some things. We were a little disappointed in the very lowest level in that the front room didn't have any furniture and looked to be in the middle of rehab. There was a space heater running and on our last night it blew the circuit and that part of the house was freezing cold. One of the refrigerators (older one) also seemed to be leaking water inside though we could never determine where from. Also when we arrived one of the three outside garbage containers was already full so we did our best to make sure our garbage fit into the other 2 cans though that took some effort. Seems like we should have had 3 completely empty cans. Everything else about the cabin was wonderful and we really enjoyed our stay. And John was very helpful! Easy boat ride or car ride to numerous marinas for food, drink, services. Easy drive to Lafollette city for groceries, beer, liquor, golf, church & chapels, medical, shopping, etc. Prices excludes holidays. Cleaning fee includes bed linens and bathroom towels. Must be a minimum 26 years of age to rent this beautiful and well maintained cabin.